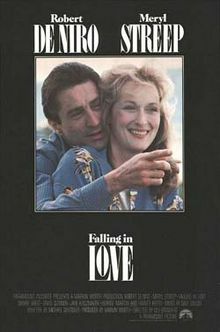 A gentle and subtle romantic drama, Falling in Love scores points for the pairing of Robert De Niro and Meryl Streep. Yet it is often achingly slow and some of the dialogue is particularly trite. 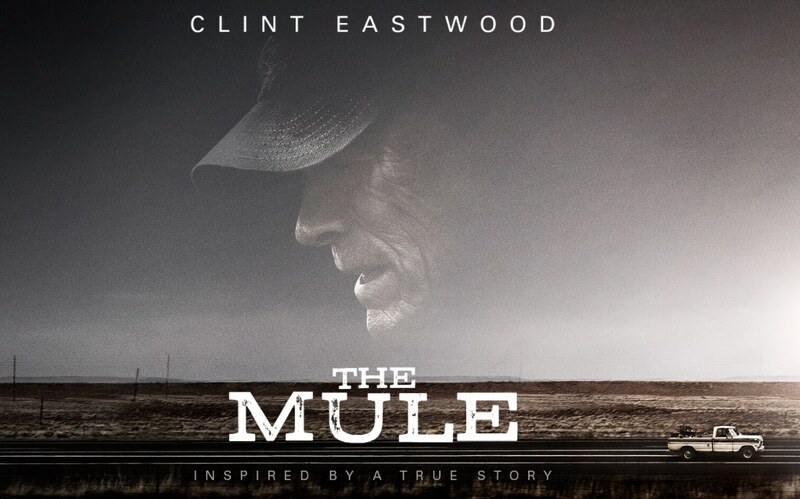 Goodness can be gleaned from the tentative story and some of it is darn effective in the emotional stakes, but I did expect a bit more from this film than it offered up. While out shopping for Christmas presents for the respective families, New Yorkers Frank Raftis and Molly Gilmore meet accidentally and a result, their presents get switched. Both don’t think much of this first meeting as they are both happily married, so they continue with their work and families; Frank is an architect, while Molly is a graphic designer. On the train a few months after, they encounter each other again and strike up a conversation. They soon find that they have fun together, and from this point on they meet for friendly talks, often on the train or in a cosy bookshop. What neither Frank nor Molly intended or expected was that this friendship would soon evolve into feelings of love for the other. Even when they are apart, they can’t stop thinking of the other and their feelings only become more difficult to ignore. Although their relationship remains chaste, they have fallen deeply in love with each other unintentionally, which causes all matter of problems as both don’t know how best to deal with these pangs of romance without hurting anyone. Director Ulu Grosbard manages to ring quite a bit of romance and bittersweet feeling from the largely predictable story, yet it can become a tad heavy-handed at times. He works best when setting up both Molly and Frank, having scenes mirror each other and give growing voice to the quickly growing infatuation. Which brings me on to the topic of the film’s execution, which is mainly one of subtle ruminations and underplayed pacing, that eventually drags in the attempts to be serious. I mean I am all for subtlety in movies, heck anyone who follows my blog will know that I am rather fond of subdued execution and natural delivery. But in Falling in Love, despite the fact that I really felt for both characters and their internal dilemmas, it was just a bit too subtle for its own good. For me, it needed something to pep it up a little and give it more power, instead of settling for the underplayed approach that became too slow. What Falling in Love does get right is a gentle emotion of uncertainty and trepidation for the main lovers, they are shown as ordinary people with complicated feelings, just like everyone else. Though the dialogue varied into clunky territory, the star power of De Niro and Streep helped make it somehow relatable and sincere. And the fact that their relationship remains one of deep love that can’t quite be fulfilled and is far from overly sexual was a bit of a refreshing break from the norm. 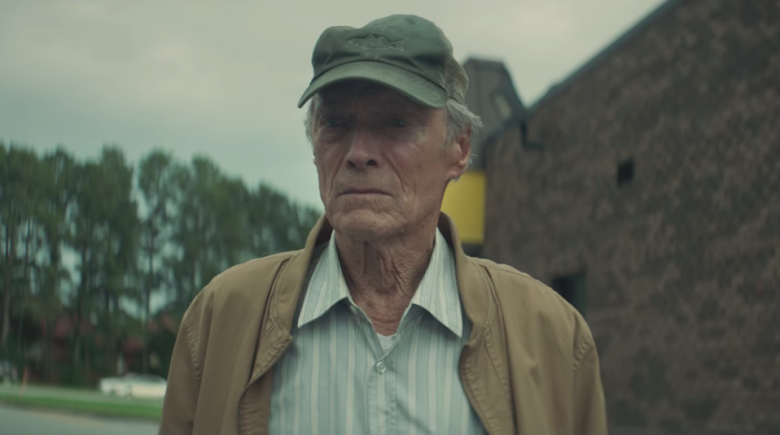 While the slow and unraveling approach feels appropriate at first, it becomes laborious and then the film starts to feel hackneyed by clichés. The music provided was pleasing at first, but it felt just way to sweet and corny in moments that were supposed to be serious and romantic. I think I was just wanting a bit more from a film like this overall than what the full product emerged as, despite my liking of some of it. 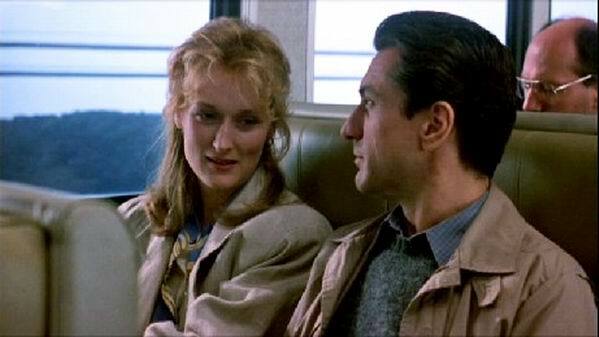 If there is something that makes Falling in Love at least a film that registers on some level, it has to be the lovely performances from Robert De Niro and Meryl Streep. They both convince as everyday people, who are taken aback and more than a little surprised by an unexplainable attraction that could spell bad things for their lives. Robert De Niro dials it down to play Frank as a decent man with a sense of humour and quiet depth that is most befitting of the character. Meryl Streep matches him with a sincere charm, flashes of humour and undercurrent of disbelief in what transpires between the two. They truly work beautifully together; hinting at the feelings between the two that for the most part can’t be acted upon, but are palpable. And their chemistry more than makes up for the slight script, breathing pathos into the dialogue with their respective skills and acting abilities. If there is a redeeming quality to Falling in Love, it lies within the work of these immensely talented actors. Jane Kaczmarek is well served with the role of Frank’s wife, who senses that something is going on, though David Clennon is a might too bland as Molly’s husband. Harvey Keitel and Dianne Wiest do what they can with their supporting roles, though the main thing you’ll remember from Falling in Love is De Niro and Streep. The two main actors in Falling in Love are the biggest reasons for watching it, as well as the feelings it emits, but the whole production just lacks that extra bit of power to raise it higher. 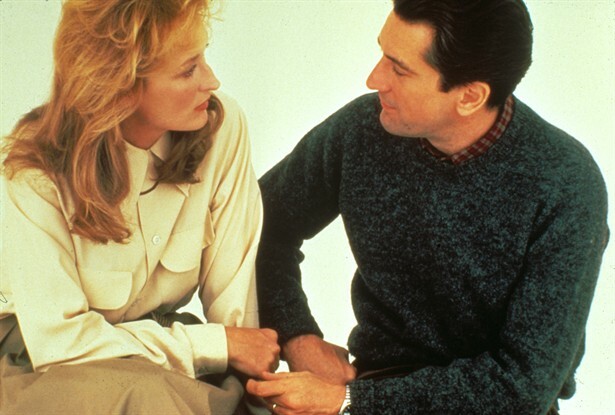 At least, Robert De Niro and Meryl Streep work beautifully together and ensure you feel for them. A film that manages to bridge the gap between horror and comedy and a successful one at that, The Lost Boys is an inventive and irreverent movie that has a good few twists and outrageous moments to add to the vampire mix. Teenager Michael and his younger brother Sam relocate from Phoenix to the beach side Californian town of Santa Carla with their mother Lucy, following her divorce. They move in with Lucy’s father, whose an eccentric man living on the outskirts of town. Exploring the Boardwalk, which is where everyone seems to go, (while their mother gets a job at the video store working for a quiet guy named Max), Michael and Sam both discover different things. Michael becomes curious and drawn to Star; a seductive young woman. She runs with a local gang of leather glad troublemakers headed by the charismatic David. David beckons Michael to join his and taunts him into an initiation that soon proves very dark for him. Meanwhile, Sam meets Edgar and Alan Frog, brothers who work in a comic store and speak of the town being overrun by vampires, which Sam sniggers at as being impossible. It soon becomes very apparent that David’s gang are not just teenagers but in fact savage vampires, who are probably behind all the cases of missing people around the town. Michael, who went through the initiation process without really knowing what it was, soon begins exhibiting strange powers and abilities that slowly take over. Sam notices this change within his brother and . Star is in fact in the same position of Michael as she isn’t a full vampire yet and wants to be rid of it. Worrying for his brother, Sam enlists the Frog Brothers in a fight to eradicate the vampires and save Michael and Star from the clutches eternal, blood-sucking life. Joel Schumacher directs The Lost Boys with a clear control over it and a sense of fun that emerges throughout it. He wisely gets the humour and horror to both be effective, instead of a seesaw of up and down switches. His flourishes of style are apparent yet don’t swallow the story. The best instance is the shots from the vampire’s perspective as they fly over the town, which is both creepy and exciting. As far as humour goes, The Lost Boys has it in abundance and forms a marvellous balance with tense horror within the tale. It captures both horror and laughs in quick succession, making sure you’re scared one minute and then laughing the next. The pace is very impressive as it introduces us to the characters and hints of weirdness, letting the darkness sink in as the presence of David and his gang becomes more known. I particularly enjoy the presentation of vampirism here as it has traditional elements, but boasts quite a few surprises in it. The vampires here are shown as seemingly cool and dangerous, the type of popular gang it would be easy to fall into. Yet once the vicious truth of them is known, they take on a different meaning altogether. This is twinned with a theme of peer pressure as Michael is shown to want to be one of the, but comes to see that it’s a living hell from which he needs to escape. David and his gang become the dark forces taking away the innocence of Michael with their powerful and unusual ways. 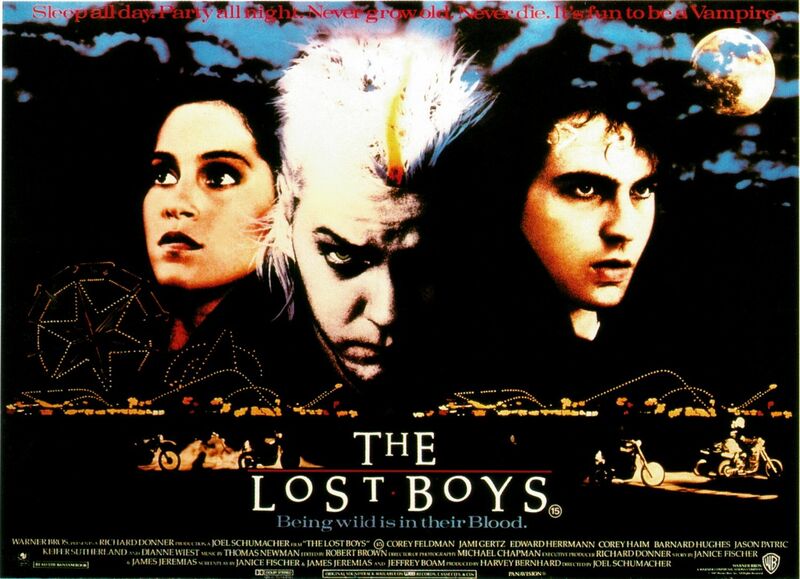 The Lost Boys can also be seen as a teen movie due to this examination of adolescence, but thankfully it’s one of the better ones due to the main touches of horror and humour. And I must gives kudos to The Lost Boys for its absolute blast of a final act. The extended climax in which Sam and The Frog Brothers face off against the vampires is as creepy as it is exhilarating. And you have to love a horror movie that has inventive deaths aplenty, including death by stereo. In terms of visual style, one can view the movie as a great time capsule back to the 1980’s. The slick and glossy nature is still there, with the vampire lair a cool retreat that looks like something made for MTV. There is fun to be had in looking at the setting and style on show, in between the outrageous comedy and creepy shenanigans. A quintessential soundtrack of mostly 80’s songs does a great job by cutting the action to these grooves, including a great version of ‘People are Strange’ that opens the film and sets the foreboding tone. A cool cast excellently does a good job in this horror flick. Jason Patrick has the required attitude and cool factor to play Michael, who soon becomes a victim of the vampires. 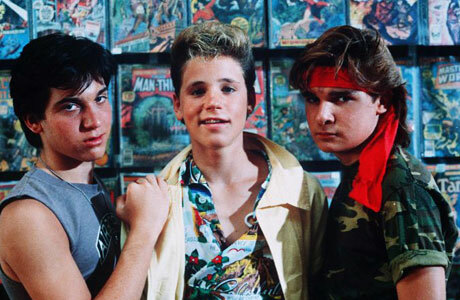 Corey Haim hits the right notes of youthful enthusiasm and brotherly concern as Sam fights to stop his brother becoming a full-on vampire. 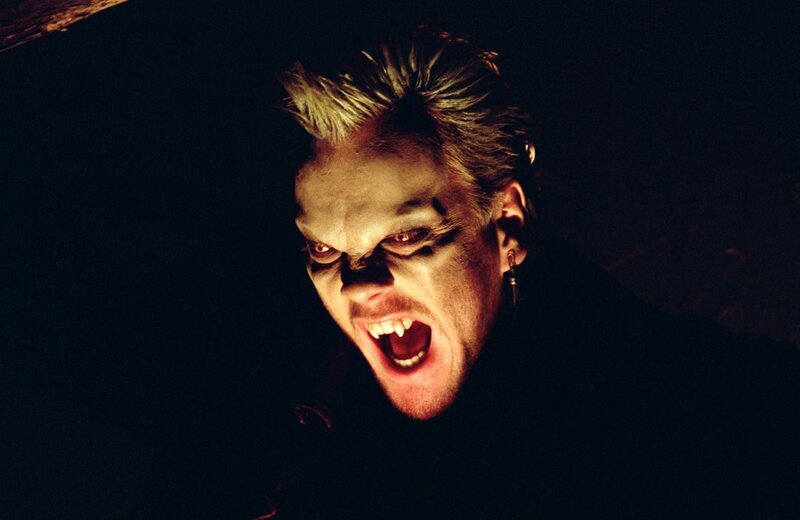 Kiefer Sutherland is one of the best things in the film. His performance as leader of the vampire pack David, is unnerving yet darkly charismatic. David is a character who embodies darkness from every angle but who you can’t help but feel intrigued by. A lot of this comes down to Sutherland’s good work that makes creatures of the night seem very cool. The duo of Corey Feldman and Jamison Newlander as The Frog Brothers is inspired. These characters are geeky and amusing in their pursuit of vampires, you just have to here some of the one-liners between the two. It’s impossible not to have fun when these two are on screen doing their thing. Displaying a sensuality that is tempered by a deep-seated terror, Jami Gertz makes an impression as the beautiful half-vampire Star who is tired of the life she leads. 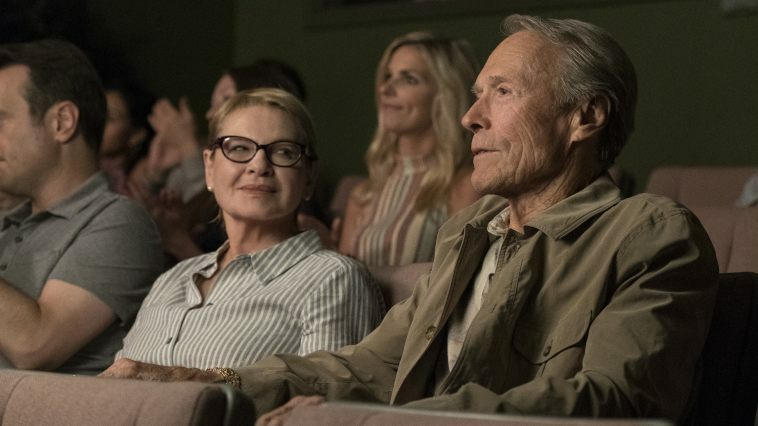 Showing maternal anxiety and warmth is Dianne Wiest in the part of the boy’s mother, who doesn’t really know the kind of town she has moved them all into. Edward Herrmann excellently takes the role of the seemingly ordinary Max, who becomes interested in Lucy yet comes under suspicion from Sam and the Frog Brothers. And finally there is Barnard Hughes as the unusual but lovable Grandpa. 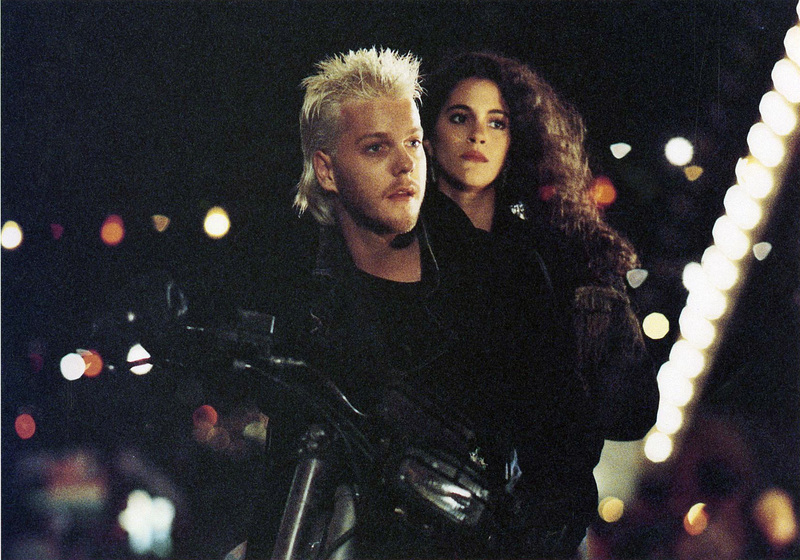 A gloriously enjoyable marriage of horror and dark comedy, The Lost Boys is deservedly a cult movie and it’s not at all difficult to decipher why.